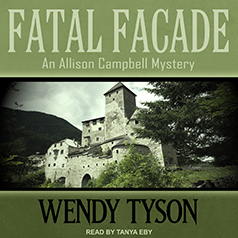 Wendy Tyson presents the fourth book in her Allison Campbell Mystery series. Allison Campbell accepted a dream assignment: a visit to the Italian Dolomites to help Hollywood socialite Elle Rose reinvent herself. A guest cottage on the grounds of Elle's historic castle promises to be a much-needed respite from Allison's harried life on the Philadelphia Main Line, and the picturesque region, with its sharp peaks, rolling pastures, and medieval churches, is the perfect spot from which to plan her upcoming wedding. Only this idyllic retreat is anything but peaceful. There are the other visitors—an entourage of back-biting expats and Hollywood VIPs. There's Elle's famous rock star father, now a shadowy recluse hovering behind the castle's closed doors. And then there's Elle's erratic behavior. Nothing is as it seems. After a guest plummets to her death from a cliff on the castle grounds, Allison's trip of a lifetime turns nightmarish—but before she can journey home, Allison must catch a killer.